The uterus is now about the size of a melon. Not just your body is changing during pregnancy but also your face can change. Many women get a softer look in their face and some people can already sense the woman is pregnant. As the pregnancy develops the face can become fuller. And after delivery you get yet ‘another’ face. 14 weeks pregnant – how is your baby growing? Your baby is now approximately 9 to 10 centimetres long and weighs about 65 grams. Your baby can move his (or her) muscles and becomes more active. Also the baby can swallow; he drinks regularly from the amniotic fluid. He also passes urine into the amniotic fluid which fortunately is refreshed every 3 hours. The baby now has 2 clear thumbs and the webbing has now disappeared. I feel pain in my lower abdomen, at my pelvis, stomach cramp's wollen gums, wen i have my trans vaginal ultrasound they didnt saw a indication that im pregnant (it hapen in my 13weeks) it is possible that im pregnant but not yet visible in my ultrasound? 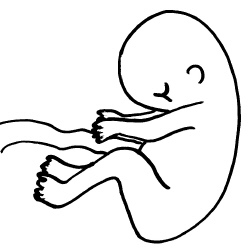 Your pregnancy in week 38 with the growth of your baby. Your pregnancy in week 24 with the growth of your baby. Your pregnancy in week 42 with the growth of your baby.